At today’s Intel Developer Forum Andy Rubin of Google announced on stage that the two companies will be continuing their partnership and that all future versions of Android will also be optimized for Intel hardware, reports This is My Next. Currently, Android is designed to run on ARM hardware and most of the phones that it is running on today use this architecture. Apparently, Intel wants to get into the low-power processor game in a big way though as it plans to have phones running on Intel chips in ‘early 2012’. The partnership with Android will give Intel an OS partner who has tweaked the software from the ‘core of the OS up to multimedia’ to take advantage of the Intel chipsets. 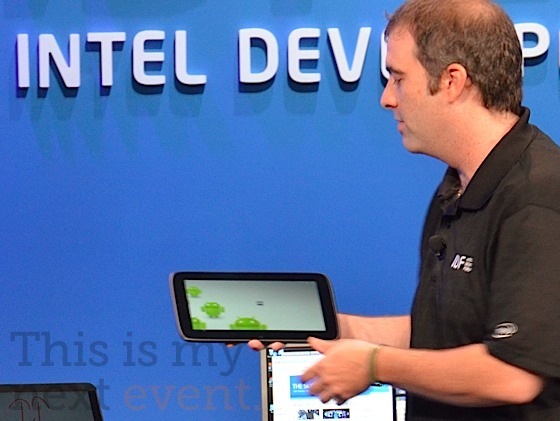 At the conference, Intel also showed off a tablet, pictured above, and phone device running on its Medfield chipset. These devices were apparently just teasers with no hardware partners announced. This is an interesting day for Android as a new chipset partner, especially one as well-established as Intel, could lead to some very powerful new phones and tablets in the new year.